With kids out of school for the summer everyone is trying to come up with great ways to keep them occupied. On top of just keeping them busy, giving them something educational to do in the process is really important. 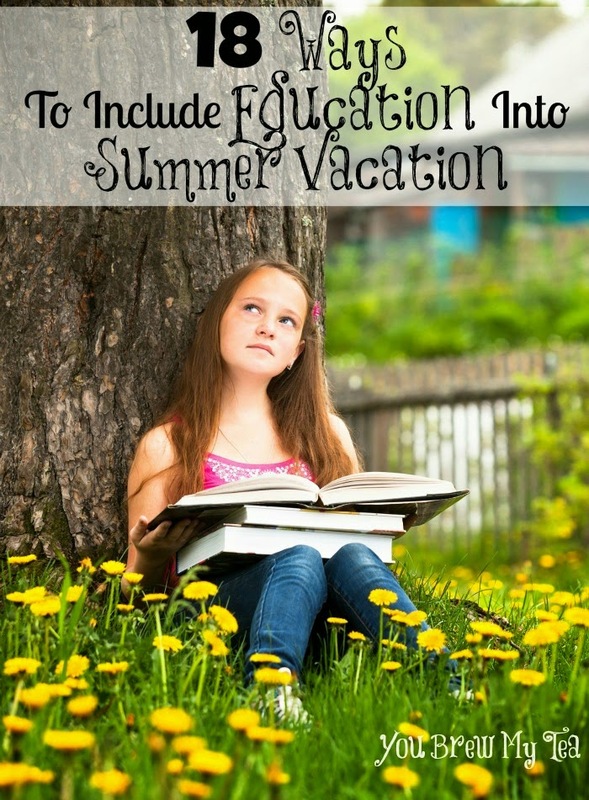 That’s where this list of 18 Ways To Include Education Into Summer Vacation comes in handy. Full of fun little ways to keep the kids thinking, you’ll have something great for the kid to do plus you won’t feel the guilt of letting all that schooling go to waste from the year before. Teach Them How To Read A Map & Compass: Perfect for road trips or fun afternoon hikes in the local state parks or forest areas. Practice Reading Road Sings As You Travel: Good for early readers extra letter recognition. Run A Kids Book Exchange/Library In Your Neighborhood: Not only will it teach the kids responsibility for their belongings, but it will encourage them to read more. It’s a great way to create healthy competition as well. Perhaps offering prizes for the person who reads the most, or improves the most in their reading skills. Open A Lemonade Stand And Teach Them About Budgeting Their Earnings: Teach them about food cost and percentage of profit. Great way to help older kids learn about using their time and money wisely. Also excellent for learning how a basic budget works. Build A Model Volcano With Baking Soda & Vinegar: Grab a kit online or create one with decoupage and newspaper. Grow Your Own Vegetables To Learn About The Growth Process: From choosing the types of plants for your area to the daily watering and weeding – this is a great way to teach them about the growth process as well as responsibility. Measure Rain Water: This is a fun way to determine if your area is in a drought period or is experiencing average rainfall. It also helps teach younger kid about measurements, and the potential to learn about weather systems. Go On Nature Walks And Collect Specimens: Leaves, caterpillars and beetles all make great specimens to examine and learn about later. Make Your Own Paints To Learn About Color Mixing: Teach about primary colors and color blends by making your own fun homemade paints. Go Star Gazing: Download one of the many free apps on your smart phone to help you know which is a star or a planet. Go To The Zoo: Don’t forget the long days at the zoo learning about all the animals, their habitats and habits. Bake Cookies, Cakes or Pies: Not only is this a great way to teach measurements, it is also a fun little chemistry experiment. Work with recipes using yeast to talk about how it develops and makes the doughs rise. Identify Clouds In The Sky: Is it cumulus, cirrus or a combination? Lay on the grass and check out the clouds in the sky. Go To The Library: Many of the local public libraries will have great reading programs, free classes and special events throughout the summer months. Visit Interactive Children’s Museums: Check your local area for fun interactive kids museums that offer education and fun. Learn How Roller Coasters Operate: Head out to the local amusement park to enjoy rides and ask more about how they operate. Spend some time online checking out resources with more information about how they are created and how gravity works to keep them in motion. Take An Art Class Together: Whether you go to a free library program or invest in a class together at a local art studio, enjoy some time learning about different techniques and mediums. Make A Bird Feeder Or Bird House: Grab a kit or make one from scratch, but spend some time learning about the birds in your area so you prepare the right type of feeder for them. No matter what you choose to do with your kids this year, there are tons of fun educational activities they can enjoy this summer. These 18 ways to include education into summer vacation are a great start for any family. Not only can you create a fun atmosphere full of activities for them, but you can feel good about what you have chosen to do with them this year.